South Florida is a place like no other when it comes to watersports and marine life and chances are if you’ve ever visited the region, you’ve either heard about or gone snorkeling. In a city surrounded by water, it’s no wonder snorkeling options are abundant. Here, we’ll share our top snorkeling destinations with you in Miami and nearby. Have your flippers, mask, swimming skills and swimsuit ready and prepare for an adventure you’ll remember for years to come. Disclaimer: A couple of these are a few hours away by car, but too breathtaking not to include. A Florida State Park located in the Upper Keys in Key Largo, John Pennekamp Coral Reef State Park was the first underwater park in the United States and includes almost 70 nautical square miles. On the National Register of Historic Places since 1972, John Pennekamp is home to various coral reefs as well as marine life. If you have a full day open and want to take a snorkeling excursion here, it’s $75 per person and all inclusive. Plan to head offshore inside the Florida Keys National Marine Sanctuary and visit two distinct snorkeling locations while you’re at sea. You have a couple different options at Biscayne National Park, where outer reefs such as Half Moon and Emerald Reef are located. Explore the mangrove coastline on a basic excursion that ranges from $40 to $45 per person. You can also participate in an excursion with Eco Adventures, a company that offers a sea kayak and snorkel adventure in Crandon Park (Key Biscayne). The latter tour costs $70 per person, lasts three and a half hours and includes kayaking along the mangroves with a naturalist guide and then snorkeling through Bear Cut Preserve. While snorkeling through Biscayne National Park, you’re sure to see tropical fish including yellow snapper, colorful angelfish, parrotfish, hogfish and more. You also may encounter sea turtles, stingrays, yellow and red coral canyons, purple sea fans and maybe even a couple nurse sharks! Atlantic bottlenose dolphins and manatees might also make an appearance. You just never know how nature will surprise you. North of Miami but worth a visit nonetheless, the Pompano Beach Drop Off is about half a mile south of the Pompano Pier. Here, you can snorkel amongst flat rock masses, seawhips, sponges and all types of coral species. There are holes and caves here, home to abundant marine life. The Drop Off is about 350 yards offshore and water is just 6 to 22 feet deep. In Miami Beach, you’ll find Tarpoon Lagoon Diving Center. The center offers both snorkeling and scuba diving excursions aboard a 46-foot custom built Newton dive boat. These excursions cost $80 per person and include a visit to Emerald Reef, Rainbow Reef, and the Half Moon Underwater Archaeological Preserve, which provides an opportunity for wreck snorkeling (the Half Moon was a 360-ton steel schooner that sunk offshore once upon a time). Make sure to check Tarpoon Lagoon’s schedule, but as of now reef trips depart Tuesday, Thursday and Saturday and include two stops over the course of four hours. In North Fort Lauderdale, Vista Park Reef is located about 75 yards offshore and a great place to view marine life, such as snapper, grunts, damselfish, spadefish, soft corals and more. To reach this reef, you have to swim out from the shore/beach access area. Just about 100 yards wide and between 10 and 18 feet deep, Vista Park Reef is not difficult to get to and a fun one for anyone who is a first time snorkeler because you can ease your way in and get there at your own pace in shallow waters. Also in the Broward/Fort Lauderdale area, you can access Hollywood North Beach Park via A1A at Sheridan Street. This one is unique because about 175 yards offshore, you’ll find a group of 2- to 4-foot ledges filled with marine life including tropical fish, tarpon, barracudas, snook and maybe even a couple nurse sharks. Separated by sand patches, you’ll find the ledges best if you swim out from the lifeguard tower near the beach entrance. This area fluctuates between 13 and 20 feet deep. In Fort Lauderdale as well, Yankee Clipper Rocks is accessible by car. Find the public parking area at the south end of the beach and then the rocky coral reef just 75 feet or so from the shore. The reef here has lots of ledges, holes and areas filled with soft coral and sea whips in addition to worms, tropical fish and various other invertebrates. Here, a dive flag is required in order for lifeguards to spot and/or swim out to you if necessary. The water at Yankee Clipper Rocks is between 6 and 14 feet deep. 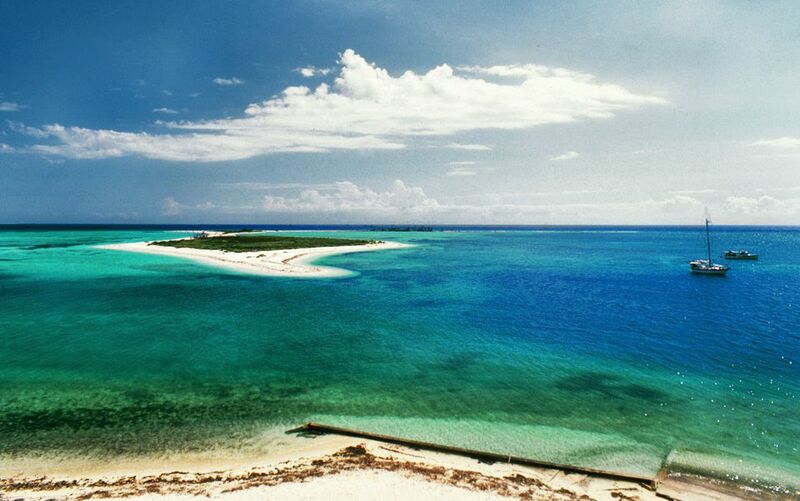 A small group of islands in the middle of the Gulf of Mexico, Dry Tortugas is a really unique place to snorkel (and camp!) because it’s almost 70 miles west of Key West (and 37 miles west of the Marquesa Keys) and accessible only by boat or seaplane. Reserve spots on a ferry or catamaran from Key West and you’ll make it to Dry Tortugas in just a few hours. The islands were discovered by the Spanish explorer Ponce de Leon in the 1500s and is home to the Fort Jefferson ruins (the fort was never fully completed). Snorkeling here is a one-of-a-kind experience with white sand beaches and shallow, crystal clear waters (just between 5 and 15 feet). It’s also easy for anyone to enjoy, no matter if they are beginners or pros in the underwater world. There are plenty of incredible corals here, lots of tropical fish, starfish, queen conchs and so much more. No need to bring fins, a mask or a snorkel for this trip if you arrived aboard the Yankee Freedom III. The crew will provide them and they are complimentary. Do pack your lunch, snacks and plenty of fluids as well as camping gear, especially if you plan to stay overnight. Make sure to do your research and plan accordingly based on seasons, weather, tours and more. This is a dry island and the most difficult on the list to get to, but 100 percent worth it no matter where you’re traveling from.